The opening Sonata of My song shall be alway will probably be immediately familiar, as it was used in its entirety in the Concerto grosso in G major, Op 3 No 3. (The second section is based on an idea from Handel’s Birthday Ode to Queen Anne.) In the first vocal number (all the texts are selected from Psalm 89) Handel ingeniously combines two ideas from earlier works: the orchestral introduction is taken from a chorale setting in the Brockes Passion, while the choral intonation in octaves on the words ‘The heav’ns shall praise thy wondrous works’ is derived from the ‘De torrente’ movement in Dixit Dominus. The solo tenor enters with an accompanied recitative, of which there are only a few examples in the anthems, and continues with a more orthodox solo dominated by angular rhythms in the accompaniment. This, and two other movements of the anthem, are reworkings of movements in the ‘Caroline’ Te Deum in D major (HWV280) of 1714. (In some sources of the anthem a trio follows at this point, but it is almost certainly an interpolation by another composer.) 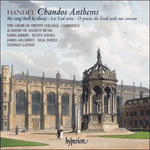 Handel sets ‘The heav’ns are thine’ as a contemplative duet for alto and bass, perhaps surprisingly, but it has an appropriate sense of awe and makes an excellent contrast to the rhythmic vigour of the chorus ‘Righteousness and equity’ that follows. The last solo, ‘Blessed is the people’, and the short concluding chorus are the other movements derived from the Te Deum. La sonate initiale de My song shall be alway semblera peut-être immédiatement familière, car elle a été intégralement utilisée dans le Concerto grosso en sol majeur, op. 3 no 3. (La seconde section repose sur une idée de l’Ode pour l’anniversaire de la reine Anne de Haendel.) Dans le premier numéro vocal (tous les textes sont tirés du Psaume 89), Haendel allie ingénieusement deux idées d’œuvres antérieures: l’introduction orchestrale est empruntée à un choral de la Brockes Passion, alors que l’intonation chorale en octaves sur les paroles «The heav’ns shall praise thy wondrous works» provient du «De torrente» du Dixit Dominus. Le ténor solo entre avec un récitatif accompagné, dont on ne trouve que de rares exemples dans les anthems, et se poursuit avec un solo plus orthodoxe dominé par un accompagnement aux rythmes angulaires. Ce mouvement et deux autres de l’anthem sont des remaniements de mouvements du Te Deum «Caroline» en ré majeur (HWV280) de 1714. (Dans certaines sources de l’anthem, il y a ensuite un trio à cet endroit, mais il s’agit sûrement d’une interpolation d’un autre compositeur et il ne figure pas ici.) Sur «The heav’ns are thine», Haendel compose un duo contemplatif pour alto et basse, ce qui est peut-être surprenant, mais il s’en dégage un sentiment de crainte mêlée d’admiration et il offre un excellent contraste à la vigueur rythmique du chœur suivant «Righteousness and equity». Le dernier solo, «Blessed is the people», et le bref chœur final sont aussi dérivés du Te Deum. Die Eröffnungssonata von My song shall be alway kommt dem Hörer wahrscheinlich gleich bekannt vor, da Händel es in vollständiger Form in seinem Concerto grosso in G-Dur op. 3 Nr. 3 wiederverwendete. (Der zweite Teil basiert auf einem Motiv aus Händels Birthday Ode to Queen Anne.) In der ersten Gesangsnummer (alle Texte stammen aus Psalm 89) kombiniert Händel in genialer Weise zwei Motive aus früheren Werken: die Orchestereinleitung geht auf einen Choral aus der Brockes-Passion zurück, während der in Oktaven gesetzte Chorsatz bei den Worten „The heav’ns shall praise thy wondrous works“ aus dem Satz „De torrente“ aus dem Dixit Dominus stammt. Der Solotenor setzt mit einem begleiteten Rezitativ ein, wovon es in den Anthems nur wenige gibt, und fährt dann mit einem konventionelleren Solo fort, das sich durch eckige Rhythmen in der Begleitung auszeichnet. Dieser und auch zwei weitere Sätze des Anthems sind Bearbeitungen von Sätzen aus dem „Caroline“-Te Deum (HWV280) von 1714. (In anderen Abschriften des Anthems folgt an dieser Stelle ein Trio, doch handelt es sich dabei höchstwahrscheinlich um einen Einschub eines anderen Komponisten und ist auf der vorliegenden Aufnahme nicht zu hören.) Händel setzt „The heav’ns are thine“ als nachdenkliches Duett für Alt und Bass, was möglicherweise überraschend wirkt, doch kommt hier eine passende Stimmung der Ehrfurcht zum Ausdruck und bildet so einen hervorragenden Kontrast zu der rhythmischen Kraft des folgenden Chorsatzes „Righteousness and equity“. Das letzte Solo, „Blessed is the people“, und der kurze Schlusschor sind wiederum Bearbeitungen von Sätzen aus dem Te Deum. My song shall be alway of the loving-kindness of the Lord: with my mouth will I ever be shewing thy truth from one generation to another. The heav’ns shall praise thy wondrous works, and thy truth in the congregation of the saints. For who is he among the clouds: that shall be compared unto the Lord? And what is he among the gods: that shall be like unto the Lord? God is very greatly to be feared in the council of the saints: and to be had in reverence of all that are round about him. O Lord, God of hosts, who is like unto thee? Thy truth, most mighty Lord, is on ev’ry side. The heav’ns are thine, the earth also is thine; thou hast laid the foundation of the round world. Righteousness and equity are the habitation of thy seat: mercy and truth shall go before thy face. Blessed is the people, O Lord, that can rejoice in thee: they shall walk in the light of thy countenance. Thou art the glory of their strength.